The springbok (Antidorcas marsupialis) is a medium-sized brown and white antelope of southwestern Africa. It was first described by the German zoologist, Eberhard August Wilhelm von Zimmermann in 1780. Three subspecies have been identified. The springbok is a slender antelope with long legs and neck, and with horns present in both sexes. Males are about 75 cm (30 in) tall at the shoulder, and females nearly 72 cm (28 in). They weigh between 33 and 48 kg (73 and 106 lb) for the males and 30 and 44 kg (66 and 97 lb) for the females. The springbok has a white head and face with dark stripes extending from a corner of the eyes to the corners of the mouth. Springbok are active mainly around dawn and dusk. Bachelor males and females form separate herds. During the rut, males establish territories. 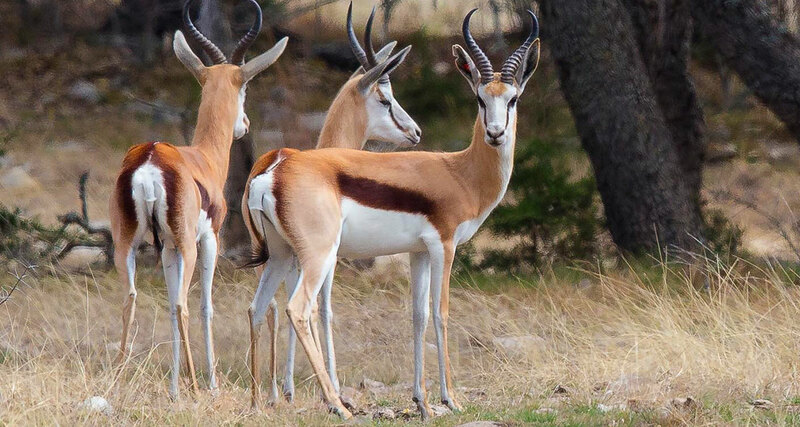 Trekbokken refers to the large-scale migration of herds of springbok seen roaming the country when large numbers of springbok inhabited the Kalahari and Karoo. Springbok often go into bouts of repeated high leaps of up to 2 m (6 ft 7 in) into the air in a practice known as pronkingor stotting. Springbok are primarily browsers, switching to grazing seasonally. Springbok mate year-round, though it might peak in the rainy season. Gestation lasts 168 days, and results in the birth of a single calf. Springbok live for up to ten years. Springbok inhabit the dry inland areas of south and southwestern Africa. The springbok has been classified under the Least Concern category by the International Union for Conservation of Nature and Natural Resources (IUCN). No major threats have been recognised to the long-term survival of the species. In fact, the springbok is one of the few antelope species considered to have an expanding population. Springbok are present in protected areas across their range.